Bad hair day! 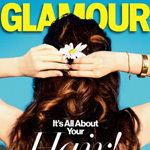 A new study reveals that only 7 percent of women love their hair. Apparently, Kim Kardashian isn't the only one who's lost that loving feeling—according to a new Dove study, most women just aren't that into their 'do, Racked reports. And though we're feeling a little underwhelmed with our tresses, it's not for want of trying. According to the study, 58 percent of women use more than three hair products a day; 45 percent prioritize their morning hair routine over eating breakfast; and 35 percent would sacrifice extra sleep for the sake of a great head of hair. Meanwhile, we've got nothing but love for Julianne Hough's new bob.